The Olive Express is the easiest and quickest way to stuff olives without the mess that comes with the job of stuffing olives. It was 2002. While pondering the crowning touch to the perfect martini, Marty Marcuccilli created an ingenious product to stuff an olive with blue cheese…and do it in about two seconds. Voila! The OLIVE EXPRESS! 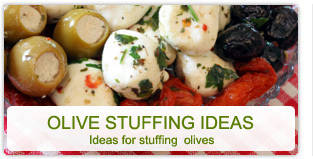 Today, the OLIVE EXPRESS is the leader in olive stuffers. Fully patented and FDA approved almost a decade ago, Marty Marcuccilli still owns and operates the business today. Other products may look similar, but beware. None are as durable and easy to use as the OLIVE EXPRESS. The OLIVE EXPRESS is the quick and easy way to not only stuff an olive, but now you can create finger foods, hors d'oeuvres and embellishments with panache and flair. The OLIVE EXPRESS is made to hold in either hand and gets the job done in three easy steps. 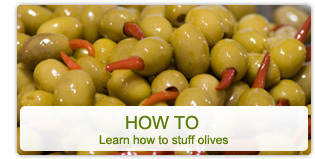 • PICK UP the filling without squeezing the OLIVE EXPRESS. 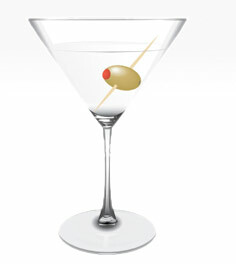 • PLACE the OLIVE EXPRESS into the olive. • SQUEEZE the OLIVE EXPRESS together to release the filling. The OLIVE EXPRESS is the easier way! No need to fumble with the clumsiness of hand-stuffing. No messy clean-up with pastry bags or syringe injectors. The OLIVE EXPRESS has no separate moving parts that can get lost or damaged. This sophisticated utensil is one self-contained jewel! The OLIVE EXPRESS is available in light-weight plastic or dishwasher-safe stainless steel. The OLIVE EXPRESS is fast, easy, durable and FDA approved.